By popular demand, I've added a powerful way to filter local and other events, so the daily "story time" at the local library doesn't have to annoy the childless, or twenty events at a local comic convention doesn't drown out other events for someone uninterested in comics. When you mouse over the area, you get options to mark the event as interesting ( ), to edit it ( ), and to filter ( ). Clicking on the "x" leads you to a list of options. Basically, you can filter out the event, the venue, or any events with certain words in them (eg., "storytime"). This page, found under "Edit profile and settings" ( or go here: http://www.librarything.com/editprofile/local ), allows you to add and remove event filters. I can get individual events hidden, but filters might need some tweaking: I can't get two events with Tony Bennett hidden because they technically don't have a title or a description. I filtered out from the River Forest Public Library, doing it from the event page, events with the title "4th & 5th Grade Book Group". However, on my "edit profile" page, it shows as Filtering events with "4th " in the title. This could be a problem if there's an event such as "4th of July Book Reading" or such. Ah. Right. I'll get on that. Can those events then be edited to no longer be in the past? Because the three upcoming events listed there technically lack titles and descriptions. Click the "edit" button on one of them to see what I mean. Ugh. I'll look into it. It's not easy. Thank god! You're awesome, Tim!!! 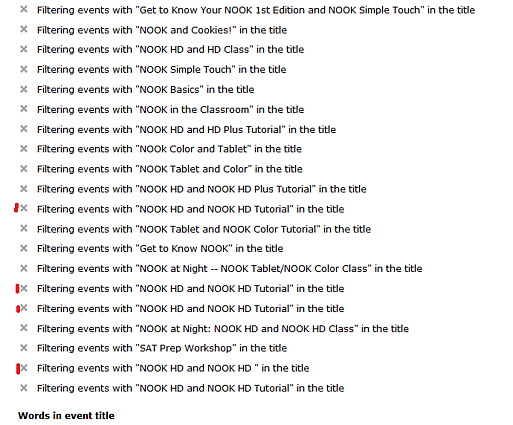 I don't need to know about the twelve Nook classes each week in my area; I hate e-books! Thanks. Those will be filtered automatically soon too—with the option to see them. You can do it for yourself. Show me where you see what you've filtered? Usually I can see them on the Local page, since I don't really check the homepage module. It'll take me a few minutes to come up with screenshots: I'm not on the usually-fast desktop (which seems to have caught that sinus bug I that's been making the rounds since November). Okay still looking for current examples, but it would be easier if I hadn't gotten so annoyed with all the Nook stuff that I started hiding them individually. MIGHT not be working on the home page. But don't worry. It's all going to change soon. Well, I cleaned up a bit -- having all the lists on one page make it harder to see what your filters are when your screen is short* -- and discovered that at least part of the problem may be the plus character in some of the Nook events. Hope this helps, but my cat wants attention. * My laptop has of the widescreen variety -- which means I have plenty of white space on either side (to put it another way, I get this horizontally) but don't get to see all that much vertically. I think that's right—it's looking for a word-barrier and + isn't one. I'll take a look. Thanks for your legwork on this! 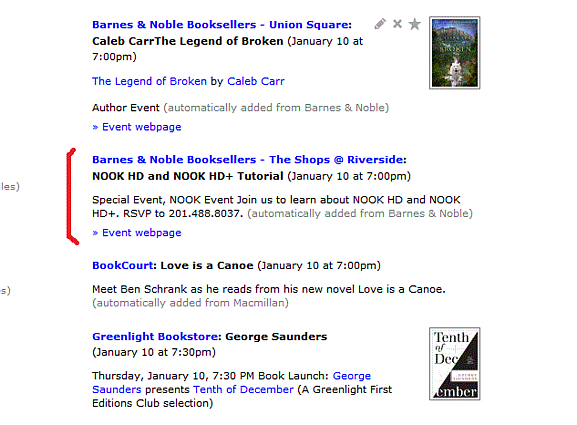 When adding events, I have always added a touchstone for a title when a particular book is being discussed, and an author touchstone when the author will be present. 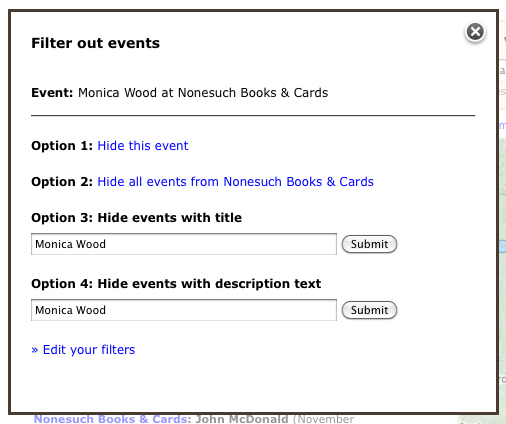 If this is how others add events, how about a filter that only shows events containing touchstones? Because the automatically added events don't use touchstones, you'd be likely to miss quite a few events. Right, but I was trying to add both locations and the event manually. I only succeeded in adding the venues. Hmmm. It's a nuisance to filter events individually, with my Home page re-reloading each time; but I'm reluctant to filter en-masse. 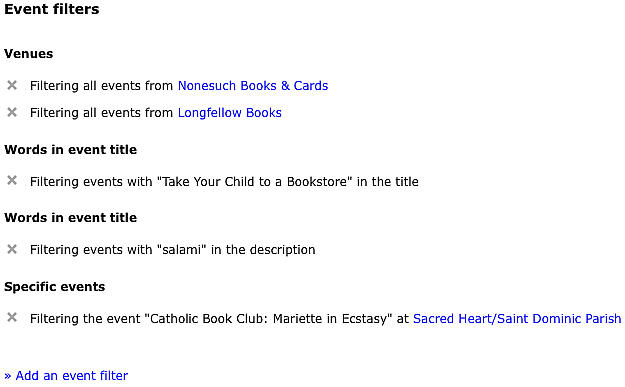 Very Good Example (I thought): If I filter out "storytime," but still want to know when Akbar Imhotep does a special program at http://www.librarything.com/venue/27922/The-Wrens-Nest-Home-of-Joel-Chandler-Har... (which you can bet should include "storytime"!) ... . What to do? Thoughts? Suggestions? I don't suppose there's anything we can do about "Event" listings that tell us ... well, nothing really? E.g., IKEA in Atlantic Station ( http://www.librarything.com/venue/83479/IKEA-in-Atlantic-Station ) has eagerly announced an "Untitled event" for today (October 12, 2013) at 1:00 pm, but not even Random House's "Author Events" webpage ( http://www.randomhouse.com/author/event/event_results.pperl?action=search&au... ) will tell us who and/or what it will be. At least we know it's at IKEA (of all places). Perhaps it's a secret -- if they told us, they'd have to kill us.) Is the only solution just to filter out all "Untitled events"? Bump. Any responses to item 25 above?